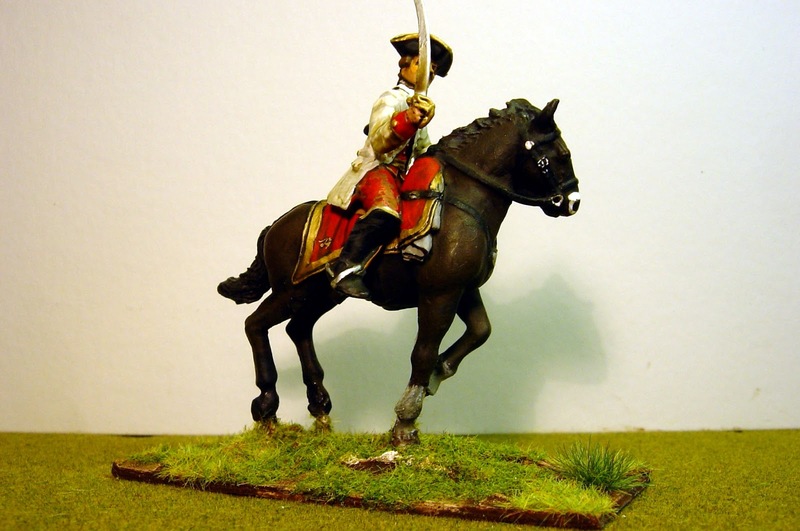 This is my first Austrian cavalry general for my 40mm army. The figure is from Trident and he is intended to be used for AWI armies - he has had a bit of a conversion to make him suitable for the WAS/SYW. The horse sculpture is very fine I think and conveys rather well the sense of a gentle canter. 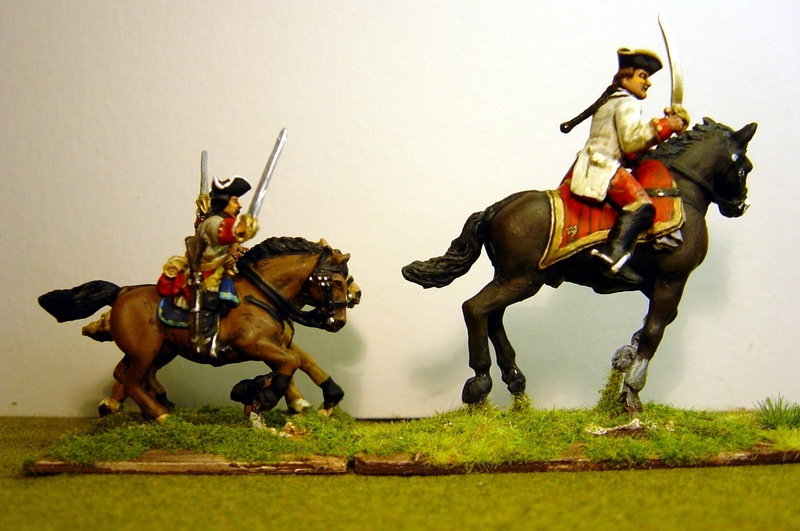 In the third picture you see a 40mm comparison with a 25/28mm cavalry figure from Front Rank. "The cavalry of the Austrian right at last began to move, but since the infantry refused to advance [against the Prussians], our cavalry became so disheartened that it could in no way be persuaded to attack, even though General Berlichingen tried to inspire them through his personal example. He spurred to within twenty paces of the enemy, he exorted, he threatened, all without any effect. He became so angry that he split the heads of two cavalrymen who were riding away, and he cut several others down from their horses....."
Our hero then appears again at Hohenfriedberg four years later where he was captured by Prussian hussars. On his capture he muttered at the Zeiten Hussar: "Do I have to be taken by a mob like this? I saw the Prussian Hussars at Mollwitz. They're a tatty crowd and they ran for their lives at the sight of the first Hungarians." The hussar punched him in the head, Berlichingen'a hat fell off, then his wig and then he fell off his horse. Nigel, he looks very good indeed. The horse in particular looks very realistic. I'd missed your other 40mm stuff, but thie figure is top notch. 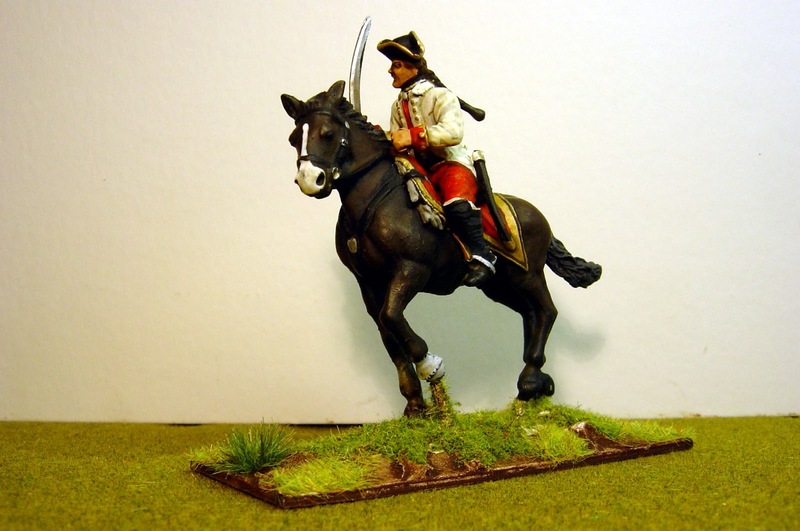 I have just recently started to do Wargaming in size 28mm Napoleonic's, it's been over twenty years since I last painted any figures. I have started reading up on wargaming re figures, paints, etc and now I have started to paint and make Wargaming my hobby, now that I am 50 years old!!! I have looked at your site (great site and figures) and would like some advice on basing my figures etc. 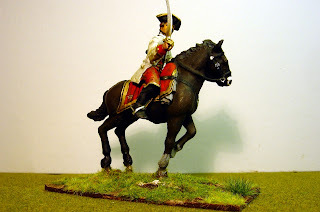 I am painting 28mm Perry and Victrix figures, I have decided to use acrylic to paint them and I am very near to finishing my first unit of (18) Old Guard Grenadiers. 1. What size should units be and can you have different sizes? 2. What size should I be basing my figures on? 3. Does it matter whether I base them in three or four on a base? 4. In the Perry & Victrix boxes you get bases, should or can I just use them for all my figures? 5. What paints do you use? I am only going to play with a set of basic wargaming rules! Please can you help and advise me. Hi Nigel - your 40mm figures are looking very good. I've been following your ambitious 40mm SYWQ army project with interest as i painted a heap of 40mm Napoleonics (Perry's , Sash&Sabre) up for a mate once and was impressed with the results. 40mm games certainly look impressive - love to see your army take the field when they're finished!